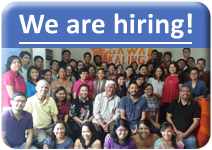 If you want to study Gawad Kalinga or work with us to contribute to its growth, you can make a difference for GK communities through internship and research. Participating students, with consent of their university advisers, apply academic concepts in GK communities and develop research materials and projects that will be used to improve the quality of life for people in need. For inquiries about available internships, please email builders@gk1world.com.